There are many different roofing manufacturers producing a lot of different products. GAF, CertainTeed, IKO, Malarkey and Owens Corning, just to name a few. All of these manufacturers have partnered with local roofing contractors that have made a commitment to install their product. These are known as “certified roofing contractors.” Depending on the level of partnership the contractor has with the manufacturer determines what they are able to offer home owners and businesses in terms of warranty coverage and other benefits. What many people are unaware of however, is that fact that many of these programs are literally just a piece of paper, and add absolutely no value in terms of being able to provide something to a customer that protects them. As a consumer, you need more than just a piece of paper in a sales folder that says “I am certified”. That is why choosing a GAF Master Elite™ roofing contractor in Tacoma, WA, is a benefit to you. Let me lay out a few key reasons why The Master Elite™ program provides the most value. 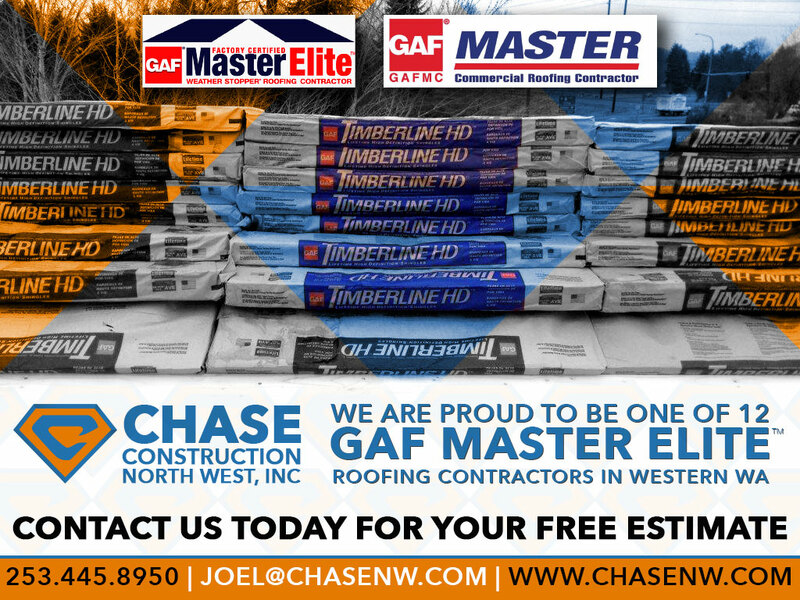 Chase Construction Northwest, Inc. is proud to be one of 12 GAF Master Elite™ contractors in Western WA. Anyone who is considered to be part of the Master Elite™ program has to go through a stringent pre-qualification process, that ensures you are the best of the best. A few of the qualifying factors are, you must be in business for 7 years, you must be financially stable and you have to have a 90% or higher verified customer satisfaction rating at all times. This weeds out many unreliable contractors right off the bat. Chase NW has a 4.5 star rating on all of our review sites and has been operating profitably and responsibly in the Pacific Northwest for over 13 years. 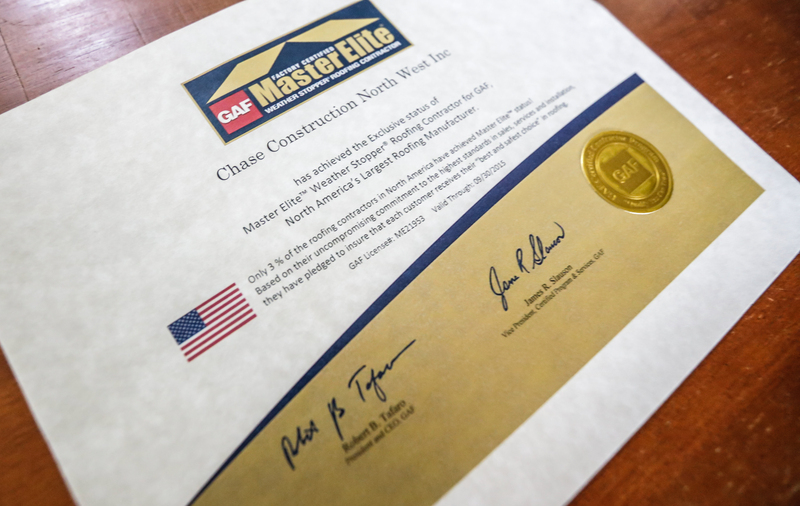 Aside from reliability, the warranty coverage Chase NW as a Master Elite™ contractor is second to none. We can provide two warranty options. The first is the Golden Pledge. The Golden Pledge provides a 50 year system warranty and a 25 year manufacturer backed workmanship warranty. In order to provide this warranty, we have to utilize a complete GAF system. With the Golden Pledge, GAF, the 125 year old roofing giant owns your roof ensuring your warranty will be valid regardless of what happens with the roofing company. This is the a sure way to have peace of mind when it comes to knowing that no matter what happens, a financially sound company will be there to take care of your roof for decades. The second warranty is called the Systems Plus. It is very similar the Golden Pledge in terms of 50 year non-prorated, but does not offer the 25 year workmanship coverage. This is a fantastic choice for a consumer that wants warranty coverage far above the standard material warranty that most roofers offer, yet can do without the full upgraded warranty package. With either choice, your roof family and home is in safe hands with our GAF Weather Stopper warranties. GAF expects the highest standards from their Master Elite™ contracting partners. In order to stay ahead of the curve in terms of providing top notch installation service and quality, we are expected and required to participate in annual continued education classes and testing. Each member of our crew is required to study and take a test from the Pro Field Guide test to ensure we are utilizing best practices and adhering to current roofing codes that qualify our work for the extended warranty program. We are proud to have earned the GAF Master Elite™ “Training Excellence Award” each year we have been in the program. Accountability provides an atmosphere for success and excellence. There are three levels accountability that keep the standards of our certification program high. Independent consumer reviews that are mailed to every home owner that receives a registered warranty are a great way to keep us accountable. These review forms are verified and instituted by GAF, so they know for certain that we are doing a great job. If you fall below the 90% customer satisfaction mark, you can be removed from the Master Elite™ program. Another tier of accountability is our “Round Table” of contractors. The 12 ME (Master Elite’s) meet annually to review participation and ensure the entire group is keeping the standard high. This is good for the industry and you the consumer. About Chase Construction Northwest, Inc.
We are a family owned and operated Tacoma roofing contractor that specializes in all types of roofing. For over 13 years we have been installing residential re-roofs, flat commercial roofs and repairs. We also provide natural light solutions for your home or business with our economical solar tube or skylights. Please feel free to reach out to us today for a free roofing or project estimate. You can either call us at 253-445-8950 or fill out our estimate form. 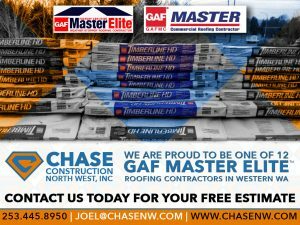 Thank you for your time and considering Chase Construction Northwest, Inc. as your roofing service provider and Tacoma roofing contractor.